The Child Development Center of Jackson County has been serving Jackson County since 1971. We are a public, non-profit child care facility, established by community leaders for the purpose of providing quality child care at reasonable costs. We provide quality child care for children six weeks old through the age of 9 years. We also offer before and after school, and full-time summer programs for school age children. Our center complies with or exceeds all state and federal regulations and we regularly pass all inspections (both scheduled and unannounced) with excellent ratings. We also provide USDA approved Breakfast, Lunch & afternoon Snack daily. 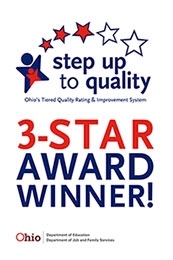 We are also a Three Star Rated program under Ohio's Step Up To Quality rating system. The only such facility in this county to recieve this Honor. We work with the Department of Job and Family Services in Jackson and neighboring counties to help supply child care for parents who work or are in training themselves. We are therefore able to offer subsidized child care to those who are income eligible. We have an excellent track record as well as a good working relationship with the Jackson County Department of Job and Family Services and the State of Ohio, Department of Child Care Licensing. We will be happy to supply you with the necessary names and phones numbers so that you can verify our professionalism and dependability. In Cooperation with the local public school systems and local colleges, the Child Development Center is a training site for the University of Rio Grande and Ohio University students majoring in Early Childhood Education; and Jackson High School and Buckeye Hills Career Center students. We are also a volunteer site for the COAD Foster Grandparent Volunteer Program, which allows senior adults called "grandparents" the opportunity to work with children while assisting the staff as needed.